The standard connecting pin is used for joining modules within the pontoon or dock area. 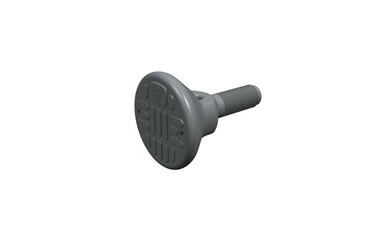 This blow-moulded pin has a robust thread and unique service and/or security feature. Using a ‘T’-bar tool, pins are screwed in to nuts which are fixed to the corner tabs of each float and tightly fix modules together. When fixed in position the top surface of the pin becomes part of the pontoon deck and is textured with a checker plate pattern to give increased grip. The internal screw connectors are blow-moulded from HM-HDPE, the same material as the large modules.